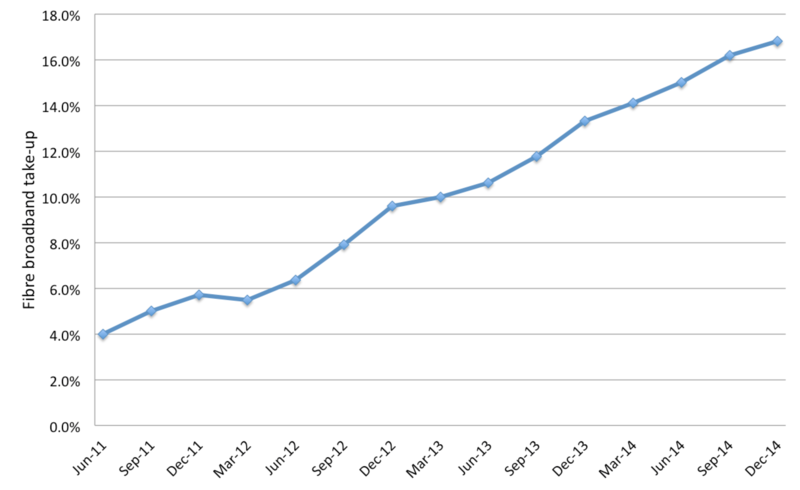 The last time I reported on the growth in BT’s fibre broadband take-up was in July 2014. Then, the take-up statistics showed absolutely no sign of an increasing upward trend and pointed to the failure of BT and ISPs to successfully get the positive messages of superfast broadband across to consumers and businesses. This was a subject I raised face-to-face with Ed Vaizey and others involved in BDUK-related roll-outs, who were very receptive at the time to the principle of demand stimulation. High take-up of fibre broadband would ensure that the social and economic benefits of superfast broadband actually materialise, and obviously would help to justify the huge investment being made across the country in fibre broadband roll-out by central Government and local councils. Furthermore, there is an extra financial motivation to drive take-up. Many BDUK contracts contain a claw-back clause where if take-up exceeds 20% in an area, BT has to return some of the public investment. In Cambridgeshire, Broadband Champions have helped to drive the take-up of fibre broadband to more than 50% in their areas – way ahead of the national fibre broadband penetration levels – demonstrating that it is possible to drive significant demand through locally-driven community schemes. However, it’s somewhat disappointing that offers of help to feed the lessons from successful demand stimulation activities into BDUK and central Government have gone unheeded. Rather than focus on building up and supporting an army of volunteer Broadband Champions across the country, BDUK has instead launched a somewhat controversial and expensive £8 million national TV advertising campaign. Decision makers have, so far at least, opted for a national top-down approach to demand stimulation rather than developing the community grass-roots approach that has seen success in local BDUK projects (as reported by the Financial Times). Click to view the BDUK TV advert below. Historically, the last quarter of the year has been the best for growth in BT’s fibre broadband take-up, so it looked like the timing of the TV advertising campaign (running in December) could not have been better. So what are the results so far? Distinctly disappointing going by BT’s results announced today, as shown in the figure below. Given that the quarter ending December is usually the best of the year in terms of increased take-up, the latest results are very poor, with a penetration growth in the quarter of only 0.6 percentage points. In the same quarter of the previous year, the increase in take-up was nearly three times greater – and that’s without any BDUK advertising campaign. While the focus on demand stimulation by Government is very welcome, and something I have been arguing for, it would be great to see more interest in learning from successful community initiatives rather than simply spending huge sums of money in TV advertising. I’m sure that £8 million would make a real difference to local schemes.